I have been approached recently by several people that would like to create a tropical getaway in their own backyard, their reasons were sound for the request, stemming from the cost of air fare for the family, the cost of gasoline, and lastly the uncertainty of the areas that they would be traveling to. So I pondered their requests, I had not considered that tropical looking plants would be able to withstand the cold Ohio winters. But I remembered recent Master Gardener trips to Schedel Gardens and the Toledo Botanical Gardens in which they both had tropical banana and palm trees. I started my quest to determine what plants would become the backbone of my tropical plant list for cold weather. 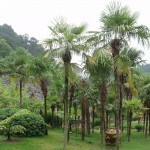 The first group I researched was the hardy palm trees, specifically the Trachycarpus fortunei which has a common name of windmill or Chinese windmill palm capable of withstanding winters up to hardiness zone 5. Winter protection should be provided until established, when mature this tree can grow to a full height of 35-60 feet. The tree leaflets can have drooping or straight tips as the plant has a wide range of variability. 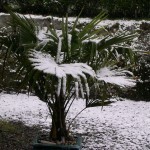 Although there are many other cold hardy palms, they are capable of withstanding zone 5 and 6 temperature ranges, but only for a short time. They are not capable of withstanding long cold spells which could extend for several weeks. But if you plan to create a small micro climate to provide additional warmth and wind protection, then you may also be interested in the following varieties. 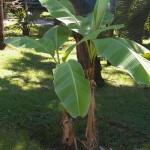 I was pleasantly surprised to find that I could grow a banana plant or tree which is commonly referred to as cold hardy banana. Specifically the Musa basjoo which can grow up to two feet a week during the summer months, the Musa does not like our winters as much. During the late fall season, the leaves will turn brown letting you know that the tree can be cut down to approximate two feet in height, mulched happily for the winter this tree will rise again in the spring to reach its full height again. Each spring, new shoots will sprout up from the plants root ball or rhizome. These shoots originate as small buds, or pups. 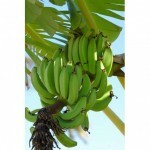 These pups can be removed and used to start new banana tree plants if you wish. 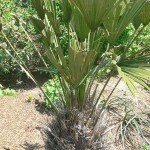 The plant can also be propagated by dividing the rhizome or root ball. Musa sikkimensis is another banana tree similar to the basjoo with a height or 12-14 feet, what is so nice about this tree is the fruit is edible. The common name for the sikkimensis is Darjeeling banana, which will mature in 6-10 years at which time the tree will flower and then fruit. After fruiting the tree will die, this is called a monocarpic plant. The seeded fruit will be 5-6 inches long with a sweet taste, although not as favorable as the typical banana provided in the supermarkets. They do have several seeds that should be removed. But when you are sitting on your deck, around your pool, or by your tiki bar, just think how beautiful your tropical paradise will look.